The all new American Q at the B Resort is open for business, and they may be in the running for best beef brisket in Central Florida. 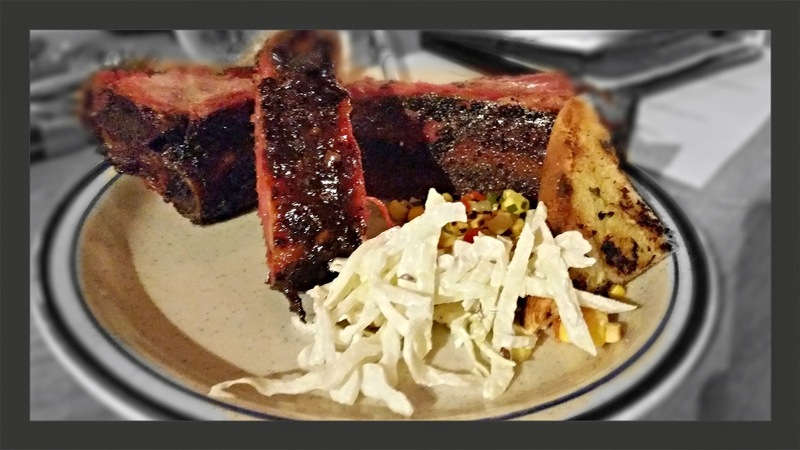 American Q is a rodízio-style concept offering a modern take on classic barbecue. Just picture the ultimate Americana version of of Texas de Brazil or Fogo De Chao, and you get the picture. 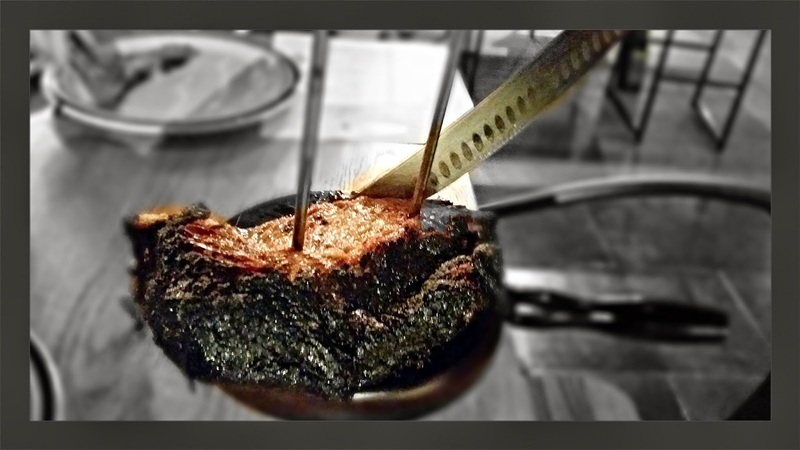 At the helm is Executive Chef Justin Leo, who has curated a unique menu that caters to the palates of barbecue enthusiasts, highlighting the flavor profiles of more than a dozen regions throughout the United States and Latin America. 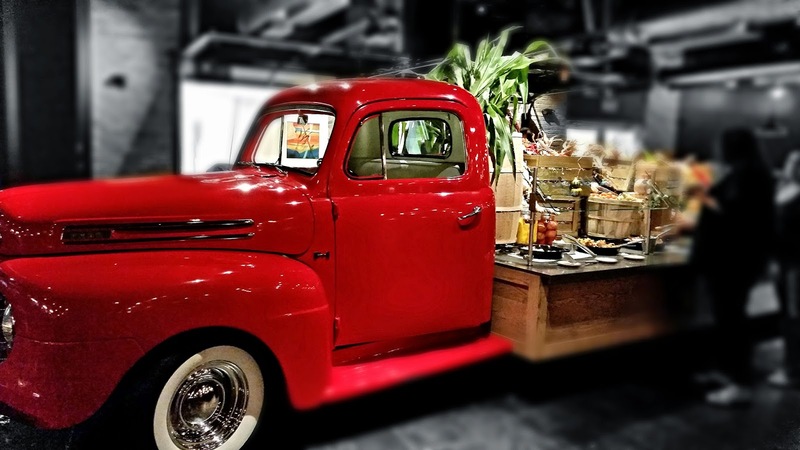 As soon as you enter, the first thing you see is the hard to miss ’51 cherry red Ford F1 pickup truck sitting front and center. Its a really cool truck, and comes loaded with its own flatbed buffet. Guests are welcomed into a completely transformed industrial country-style setting with multiple seating options that range from a communal table to booths and a semi-private dining room that seats 40. The look inside is set amidst the charm of a distressed brick smokehouse, a barn-inspired wood-clad bar and mason jar chandeliers. 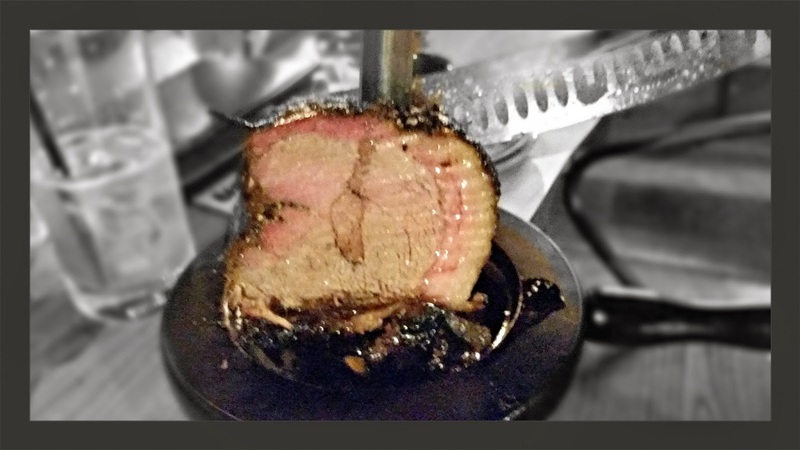 For $34.95 per person (tax and gratuity additional), you can indulge in an all you can eat barbecue journey. Start with more than 20 selections from the flatbed, which highlight Florida’s fresh produce, specifically micro-greens, lettuce and tomatoes. House made specialties like the daily soup and chili and a selection of seasonal salads like a Florida tomato salad are just a few of your options. Of course nothing says Americana like a baked potato bar and a baked sweet potato bar. There are other made from scratch sides too, like spinach gratin and house apple & caraway slaw as well as a touch of the south with Gulf peel & eat shrimp. After you visit the buffet, its time to loosen up your belt a few notches and get ready for the rodízio parade of barbecue meats and poultry. 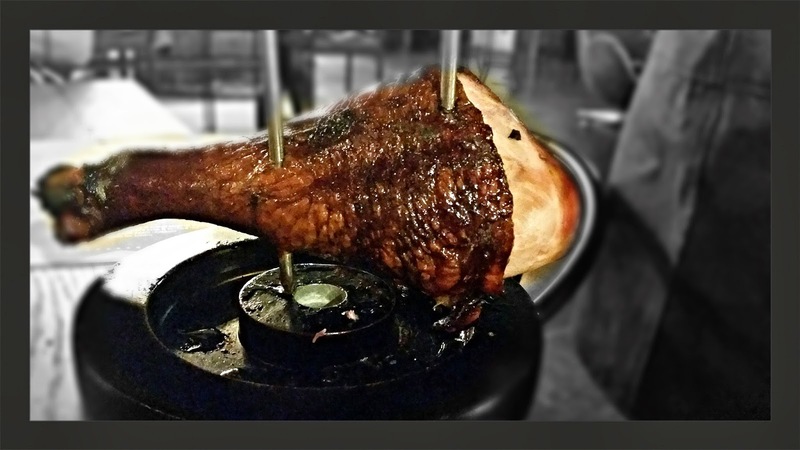 You will get an endless selection of slow smoked turkey drum, cold smoked & grilled turkey thigh with turkey chorizo stuffing, bacon wrapped boneless chicken thighs, house made sausages, smoked pork shoulder, Texas bark beef brisket, picanha of beef, Carolina style flank steak and vegetable brochette. You then have the option of having the complementary soft serve ice cream for desert, or you can order off of the ala carte menu. In addition to the one price buffet you can also order main dishes that include a selection of 16 additional offerings. St. Louis spare ribs, 6 hour smoked spare ribs, grilled Argentinian spiral house made sausage, and a wood fire grilled jerk rubbed whole boneless snapper are a few of the options. All of the meat at American Q is from Florida Fresh Meat Company and is grass fed, hormone free beef and pork as well as free range chicken. The restaurant is dedicated to supporting local farms when possible and makes several items from scratch including their sausages, sides and sauces. In addition to a starter of house made tater tots and devilled crab stuffed eggs, the Swine Candy was an instant hit. 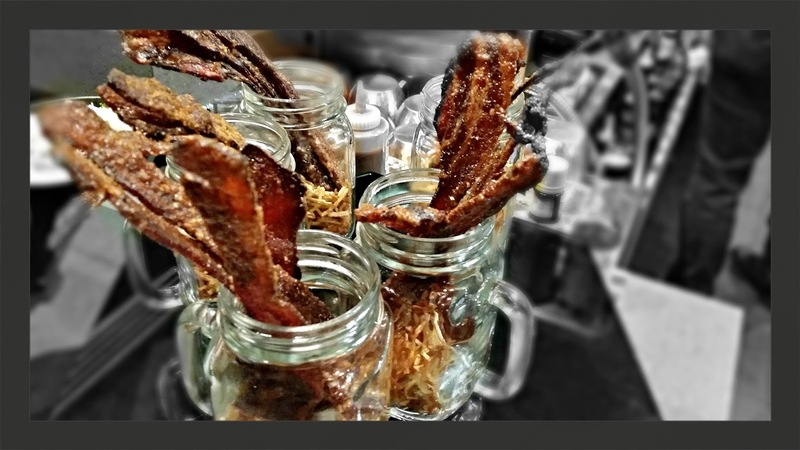 The Smoked bacon is roasted with molasses and spice and is served nice and crunchy. 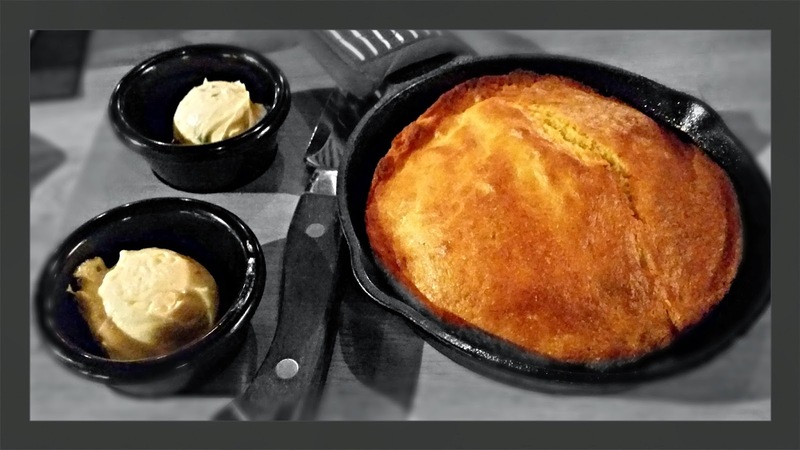 Chef Leo’s personal touches include a baked-to-order Cornbread Skillet, which is included complimentary with the buffet. 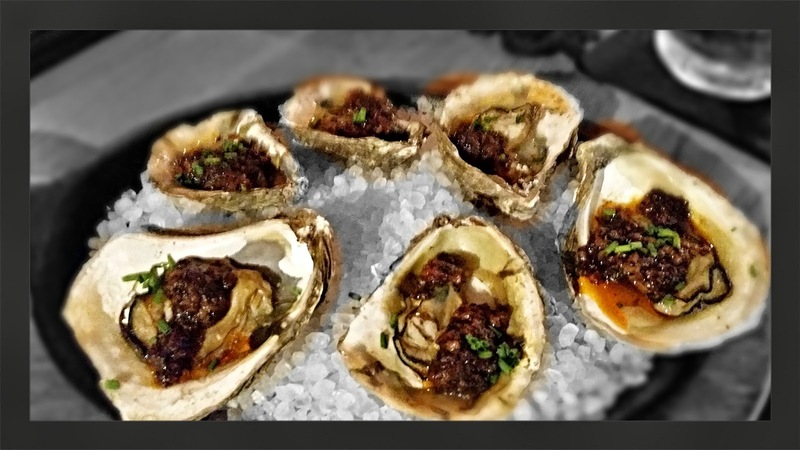 The Virginia Oysters are served with bacon jam and are grilled in shell which gave them a wonderful flavor. 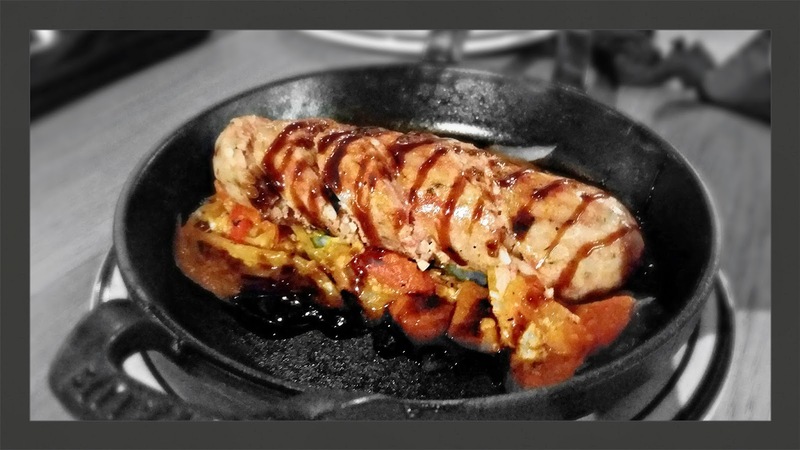 Alligator Boudin was a very unique and flavorful sausage made with farm raised gator, tomatoes, peppers and okra. 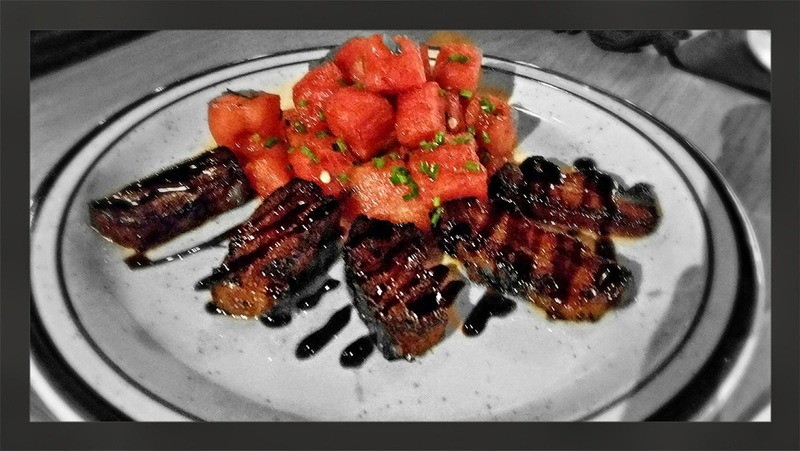 The Mahogany Glazed Pork Belly with spicy watermelon salad was another awesome appetizer. 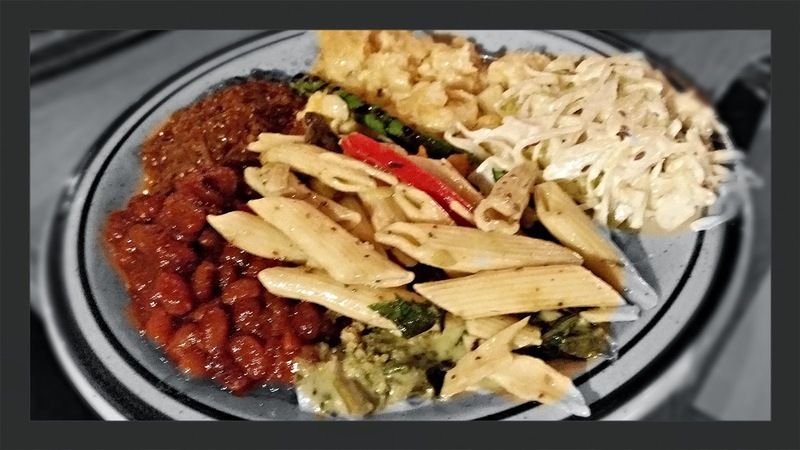 My trip to the Flatbed Buffet included maple baked beans, pasta salad, apple & caraway slaw, and chili. I don't say this lightly, but the BEEF BRISKET at American Q is quite possibly the best beef brisket I have had in Central Florida. I mean WOW good. 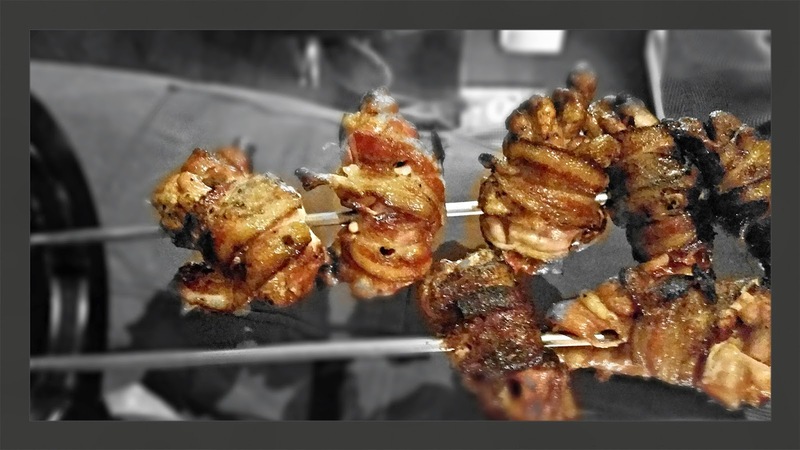 The Bacon Wrapped Boneless Chicken Thighs were really good. They had a very nice smoky flavor, and were moist and tender. One of my favorites was the Smoked Pork Shoulder. It is cooked with spiced onions that add a bit of a sweetness to the smokiness. The Slow Smoked Tom Turkey was pretty good as well. It was cooked with a Mahogany glaze. We did sample some of the Main Dishes like the Hot Smoked Salmon and a selection of ribs. The St. Louis Spare Ribs and the Texas Bark Beef Ribs were pretty tasty. 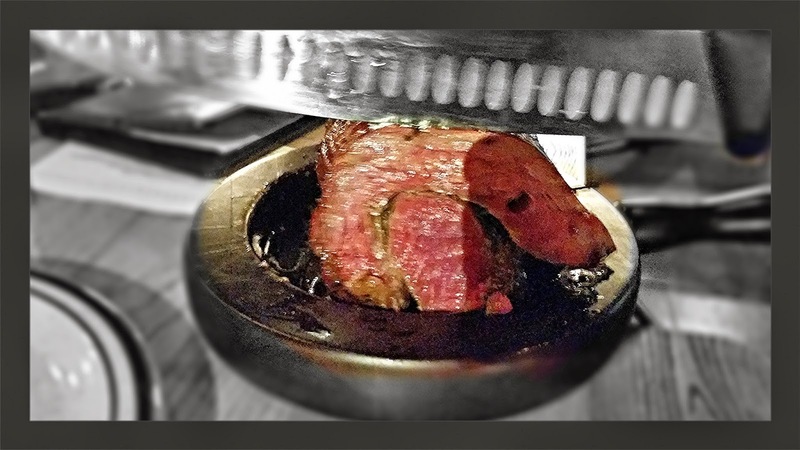 Just like a traditional rodizio grill, American Q has its own Picanha of Beef. Its a prime cut of top sirloin that is grilled to perfection. It was delicious on its own, but I added a splash of Mango Heat sauce to kick it up. Deserts were very good and very home style. 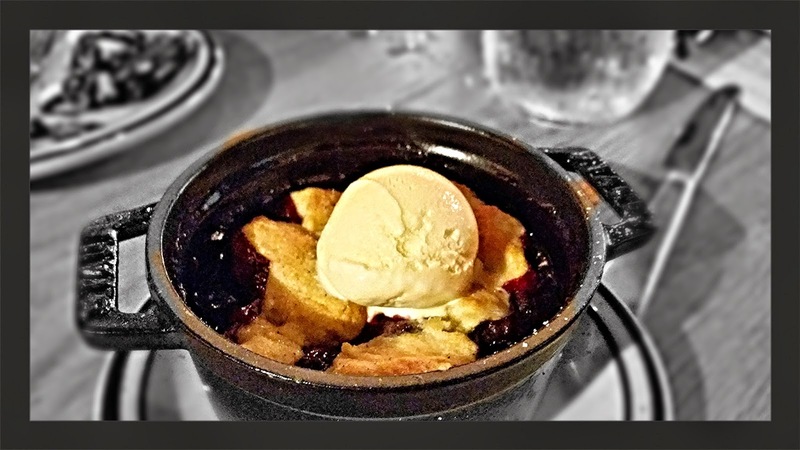 The Berry Cobbler was something like your grandma use to make. 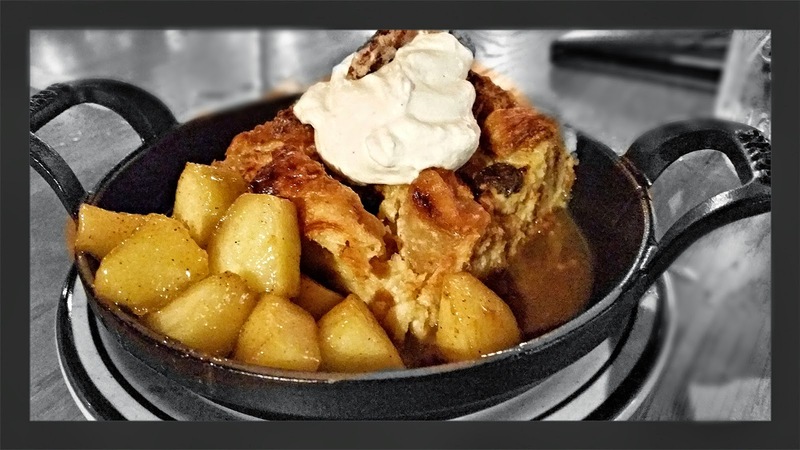 The Croissant Bread Pudding with apple compote was very enjoyable. Its a classic dessert with a gourmet twist. By far, the S'mores Pie was the favorite. 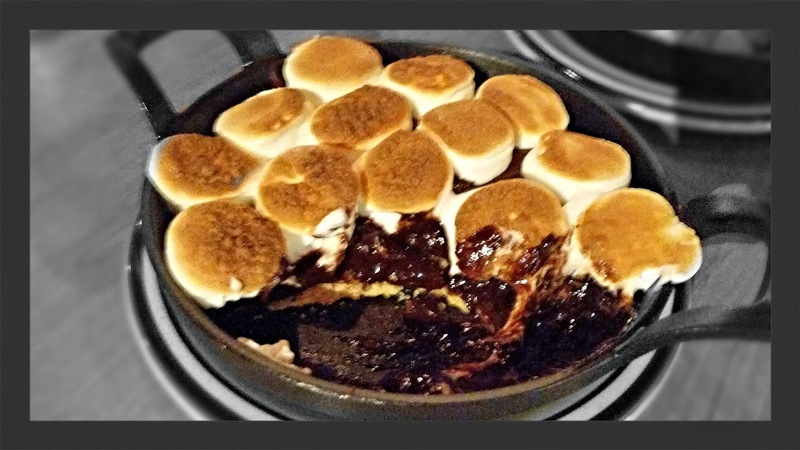 Layered graham crackers with flourless chocolate cake and topped with toasted marshmallows..so rich and so good. American Q also has a full service bar that offers creative cocktails, wines and a large selection of craft beers from regions throughout North America as well as a dedicated nine item bar snacks menu. Items included are the restaurant’s signature Swine Candy, House Made Tater Tots with bacon salt and Deviled Crab-Stuffed Eggs with blue crab and remoulade. The restaurant is open daily for dinner from 5 p.m to 10 p.m. and the bar is open Monday through Friday 2 p.m. to midnight. On weekends American Q is open at noon. A daily Happy Hour features half off drinks and is available from 4 to 7 p.m. This is a fun place to bring the whole family, or just a group of people who want to devour some meat. I really like the concept, and all of the old world American decor and vibe that American Q has going on, not to mention the food as well. All of the meat we sampled was very flavorful and cooked with a sense of down home BBQ pride.